The historically famous town Arani (Tamil: ஆரணி which is written as Arnee, Arani or Arni) is on the banks of Kamandala Naaga river, in Tiruvanamalai district of Tamil Nadu. The town is around 38 kilometers from Vellore and 60 kilometers from Thiruvannamalai. The city is well connected through various well formed roads, the state highways SH-4 (Arcot - Arni - Gingee - Villupuram Road), SH-132 (Kannamangalam - Arni Road) are the major roads connecting Arani. The silk textiles that are produced in this town are well known and famous as ‘Arani Silk’. There are three variations given for the town being called Arani. Aar means Athi [fig] tree in Tamil. Since there were lots of such trees in the area this place got the name Arani. Secondly it got its name from Sanskrit word Aranyam [means forest]. [Interestingly the nearby place Arcot also derived the name from [Aar] Athi tree and kadu [forest]]. Thirdly since the river Kamandala Naga River [river is Aru [ஆறு] in Tamil] flows through the place, it was called ARaNi [ஆறு + அணி] in due course it became AraNi [ஆரணி]. The river Kamandala originates from Javathu Hills and Naga River originates from Amarthi hills near Kannamangalam and both these rivers amalgamate in Samburayarnallur near Arani and flows through Arani. Arni was ruled by the Cholas after they defeated the Pal lavas. Some of the important Chola kings who ruled Arani are Kulothunga Cholan I, Vikrama Cholan, and Kulothunga Cholan II. During 1361 the war that ensued near Padavedu, Sambuvarayan fort, many evacuated from there and resettled in Arani. In the year 1638 the place was gifted to Vedaji Bhaskara Pant as Jaagir by Shahjee [father of Sivaji] for the services provided by him. In accordance with the treaty of 1761 between English and Tipu Sulthan this area was transferred to Karnataka Nawab. More or less the area was under Arani Jagirdar till Indian Independence. Arani Jagir had gone, so also the fort of old days. But there is some mark which reminds you about the place where fort once stood. As you get down at the bus stop very near that you will see a big ground and there is a war memorial in the centre. The fort area encompasses the present Municipal office, the government boys/girls schools, SS higher sec school, deputy collector’s office, police station and some other government offices. The fort was surrounded by a huge moth. Today the moth is not there, but in some part you may able to see the old fort wall in bits and pieces. 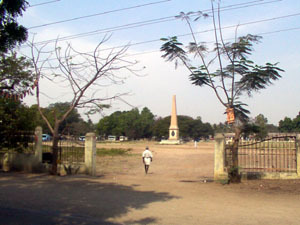 The road which leads to “Surya Kulam” [Surya tank] and “Chandra Kulam” [Chandra tank] from the fort area is where the original gate to the fort was there. There are few ancient temples in Arani. 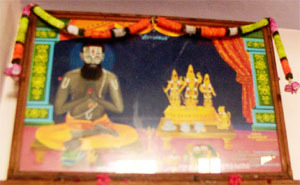 Sri Kailasanather temple in fort area, Sri Vedagiriswarar in Pallayam area, Sri Puthra Kamateeswara Thirukoil in the banks of Kamandala Naga river, Sri Arunaachaleswar temple in Arunagiri nagar, and Sri Vembuli Amman temple, Sri Kothanda Rama temple and Sri Anjaneya temple in Subramania Sasthriar Road, to mention few. Sri Sri Durga Prasad Swamiji is a saintly person and follower of dwaitha philosophy of Swami Sri Ramnanda of Varanasi [Followers of this philosophy are known as Ramanandi sect also called RAMAVAT sect]. He was on a pilgrimage to south and in the course of his travel had come to Arani during mid 19th Centaury. He was attracted by the sanctity of the place and the river; he started his penance on the bank of Surya Kulam [Tank name after Sun God]. As a devotee of Sri Rama, he dreamt of building a temple for Sri Rama in this place. His devotion and penance meditating upon Sri Rama spread to the others in town. Soon he had many followers and with there help he had built a small temple for Lord Sri Kothandarama. Today the temple for Sri Kothandarama is in Sri Subramania Sasthriar Road, [a great freedom fighter from Arani] more popularly known as Devikapuram road. Today this temple had been improved by Swamiji’s followers and other public. The main deity of the temple is Sri Kothandarama along with his parivara. Sri Sri Dura Prasad Swamiji had taken to Samadhi and Swamiji’s Brindavanam is on the back side of the temple. Sri Anjaneya had been installed in the Brindavan just opposite to the Samadhi. There are regular visitors to this brindavan, who lit oil lamp in the Sri Anjaneya sannadi and prays to Swamiji. Swamiji use to take his bath in the ‘Surya Kulam’ [சூர்ய குளம்] and first offer his prayers to Sri Hanuman in the bank of the tank. Take permission from Him to go to Sri Rama temple for his day’s pooja. It was the daily practice of Swamiji to worship Sri Anjaneya in the banks of Surya tank first then proceed to Sri Rama pooja at Sri Kothandaramar temple. The place where Sri Hanuman was installed on the banks of Surya tank was just few yards away from Sri Kothanda Ramar Temple and on the same Subramania Sasthriar Road. The followers of Swamiji started improving the temple of Sri Kothanda Ramar. With every improvement made in building Sri Kothanda Ramar temple, shelter of Sri Hanuman, also saw improvement. In course a temple had been built for Sri Hanuman on the banks of Surya tank. The temple is simple with garbhagraham and a hall in front of it. The temple has a big courtyard in front of the temple building and an arch flanked by Sri Garuda and Sri Anjaneya welcomes the devotee to the temple. 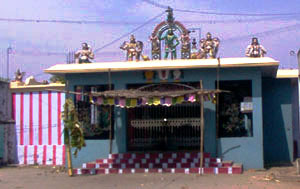 During Saturdays there is large attendance of devotees to this temple. Sri Veera Anjaneya of this temple is standing posture with His right hand gesturing ‘Abya Mudra’ and Lords left hand is resting on the left thigh. His tail is seen raised over His head. Lord is seen adorning ornaments on lotus feet, hip, hands, chest and neck. His mesmerizing eyes make the devotee forget the world and think only of the Lord. A visit to this temple and dharshan of Sri Veera Anjaneya is sure to bring the Sri Rama Bhakthi of His devotee upper most in life.